"Share ideas for dressing up for afternoon tea. Is your favorite tea-time outfit a silk caftan, flannel jammies, or a dress with proper hat and gloves? Do you enjoy wearing tea prints to tea? Or do you prefer something more elegant? Lace and ruffles? A feathered hat? Long pink gloves? Satins and silks? Cotton comfort? Jeans and a t-shirt you say? That's okay --- share it all here.Pictures of you in tea-time costume are welcome! But, if you are not brave enough to share a picture of 'you', simply share something you think would be FUN to wear to tea. Remember, a tea can be anything from a formal afternoon tea --- to tea in the park with a friend. It's whatever it means to you!" OK, the subject is dressing for tea. I don't know where I heard or read way back in my early years of learning about afternoon tea that "a lady should always wear a skirt or dress to tea." I admit I have broken that rule more times than not. My style of dress for afternoon tea is "tastefully casual" usually basic black pants or Capri's with a nice top and often a sweater or jacket. I enjoy wearing tea-themed jewelry. 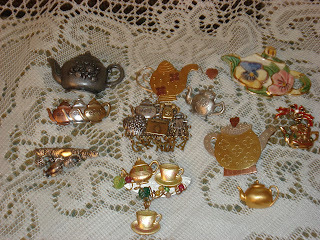 The photo above shows some of my teapot lapel pins. The whimsical one in the center of the bottom row was made by KY crafts person Robbie Moriarty and is one of my favorites. On Feb. 5 I posted photos of beaded tea-themed items made by daughter Melissa and on Jan. 19, gold teapot earrings made by Estelle. The top photo is KJ, our Princess. She loves to have tea with Grandma. 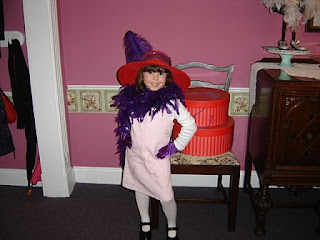 This photo was taken at Mrs. Teapot's Tea Room in Bellvue, KY when she was 5 years old. She will soon celebrate her 7th birthday with a tea party for her friends (her choice). Her mom and I have planned the menu and activities and she is counting down the days! The sad news is they live too far away for Grandma to attend. I'm counting on seeing lots of photos! How wonderful that your granddaughter enjoys having tea with you! She certainly looks as though she enjoyed the day, and it must be such a thrill for you that she is so looking forward to her next birthday tea! And I love the tea-themed jewelry. I've made a note to myself to add to my collection! Reading your post was sheer delight! Your grandaughter looks absolutely stunning in the hat. A tea party... What a wonderful way to celebrate a birthday. The Princess certainly is adorable and knows how to strike a pose. Isn't it wonderful that she loves to have tea with you?! Hope you get tons of pictures of the birthday tea. Your tea-themed jewelry is great! She is a little cutie! I really like your tea time jewelry! Your little princess is totally adorable! She looks so sweet, all dressed for tea. You are one fortunate grandma! I love your tea jewelry as well. I have a few pieces, and although I don't wear them very often, I do enjoy looking at them and appreciating their tea-ness! What an adorable granddaughter! That is so special that she enjoys tea, too. 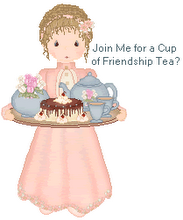 I love your tea time jewelry ~ what a fun thing to collect! How did you enjoy tea at Mrs. Teapots? My daughter has been wanting to go there. What to you reccommend on the menu? 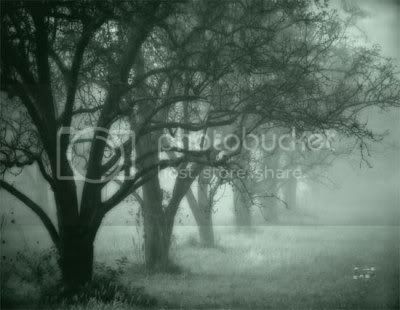 Stop by and leave me a comment if you don't mind. I was thinking of going after the Joint Concert of the CSO/CSYO at Music Hall the first of next month. Your tea-themed jewelry is very attractive. Precious tea part girl! The jewelry is just lovely! Thanks for sharing! oh, oh - she is SOOOOOOOO precious! Just precious! Love her outfit! And you have the most tea-themed jewelry I've ever seen. I'm jealous! I love your tea pin collection! Thanks for sharing! Ohhh, love the tea-themed jewlery. I have just a few pieces myself but have my eye for more that may cross my path. Your grandaughter is a cutie...great picture! How funny that this is your current blog post...I just tried to email you (but it came back) about Mollie's first real "tea party"...it's my blog post from yesterday. Yes, I put her in a flowery fru-fru dress...I figured that was the "custom" for a girlie-girl tea party. what a fabulous collection of jewelry!!! and your little one is adorable!